Yellow-rumped Warblers have been CRAZY today! Singing all over the place!! Is it just me or is anyone else hearing them in the tree tops? This entry was posted on 22 April 2010 by mon@rch. It was filed under Nature . No, I haven’t heard them. I will get my CD out to see if I recognize their song since I haven’t seen them here. Lovely photo. Your photographs are so beautiful. The one of the warbler is so vivid and real, I think I really can hear its song! I also love the photo of the monarch on your blog title. We have found about a dozen monarch caterpillars this week on our milkweed. They have migrated here (south TX) and now another generation will be ready soon to continue northward. I think these birds are so pretty! Love their markings. 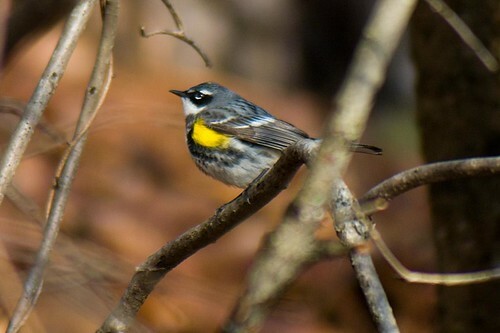 Warblers are here–spring is here for sure.